HF: We have two articles about Imperial Airways, both linked below. I thought it would be useful to have a general history of this now almost forgotten company which through various merges eventually became British Airways. Any information about or images of the airline in Hong Kong would be of great interest. 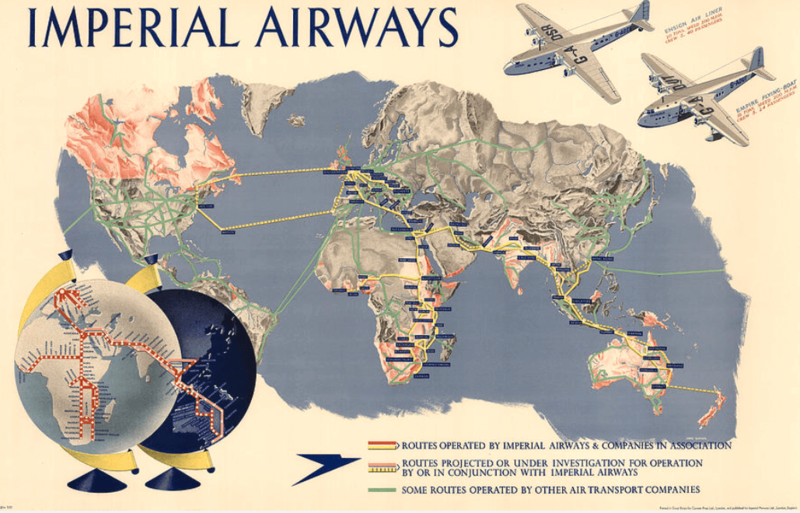 “Imperial Airways was the early British commercial long range air transport company, operating from 1924 to 1939 and serving parts of Europe but especially the Empire routes to South Africa, India and the Far East, [including Malaya and Hong Kong]. There were local partnership companies; Qantas (Queensland and Northern Territory Aerial Services Ltd) in Australia, and TEAL (Tasman Empire Airways Ltd) in New Zealand. Created following the advice of the government Hambling Committee in 1923 — that the main existing aircraft companies should be merged to create a company which would be strong enough to develop Britain’s external air services — and offered a £1m subsidy over ten years if they merged. Instone Air Line (two aircraft). Lieut-Colonel Frank Searle. (Managing Director). The land operations were based at Croydon Airport to the south of London. IAL immediately discontinued its predecessors’ service to points north of London, the airline not being interested in serving what they regarded as the ‘Provinces’. The first commercial flight was in April 1924, when a daily London-Paris service was opened. Additional services to other European destinations were started throughout the summer. The first new airliner was commissioned by Imperial Airways in November 1924. In the first year of operation the company carried 11,395 passengers and 212,380 letters. The extension of service to the British Empire (Empire Services) was not begun until 1927 when, with the addition of six new aircraft, a service was instituted from Cairo to Basra. but the first service from London for Karachi did not start until 1929 using newly purchased Short S.8 Calcutta flying boats, even then the passengers were transported by train from Paris to the Mediterranean where the Short flying boats were. In February 1931 a weekly service between London and Tanganyika was started as part of the proposed route to Cape Town and in April an experimental London-Australia air mail flight took place; the mail was transferred at the Netherlands East Indies, and took 26 days in total to reach Sydney. The purchase of eight Handley Page HP.42 four-engined airliners boosted the range of services, in 1932 the service to Africa was extended to Cape Town. In Australia in 1934 Imperial and Qantas (Queensland and Northern Territory Aerial Services Ltd) formed Qantas Empire Airways Limited to extended services in Southeast Asia. But it was not until 1937 with the Short Empire flying boats that Imperial could offer a real through service from Southampton to the Empire. The journey to the Cape consisted of flights via Marseille, Rome, Brindisi, Athens, Alexandria, Khartoum, Port Bell, Kisumu and onwards by land-based craft to Nairobi, Mbeya and eventually Cape Town. Survey flights were also made across the Atlantic and to New Zealand. By mid-1937 Imperial had completed its thousandth service to the Empire. 1934 the Government began negotiations with Imperial Airways to establish a service to carry mail by air on routes served by the airline. Indirectly these negotiations led to the dismissal of Sir Christopher Bullock, the Permanent Secretary of the Air Ministry, who was found by a Board of Enquiry to have abused his position in seeking a position on the Board of the company while these negotiations were in train. 1937 Imperial Airways began regular operation of its Southampton to Alexandria services with C Class flying boats. Opened Hythe flying boat base, on Southampton Water, for these services. After that only the airline’s European services were operated from Croydon. 1937 The Empire Air Mail Programme began in July 1937, delivering anywhere for 1½ d./oz. By mid-1938 a hundred tons of mail had been delivered to India and a similar amount to Africa. 1938 construction was started on the Empire Terminal in Victoria, London, designed by A. Lakeman and with a statue by Eric Broadbent, Speed Wings Over the World, gracing the portal above the main entrance. The terminal provided train connections to flying boats at Southampton and to the since closed Croydon Airport. The terminal operated as recently as 1980. 1938 20 January: The first flight refuelling test was conducted with an Imperial Airways C Class flying boat; the aircraft was refuelled from an Armstrong Whitworth AW23 under the direction of Alan Cobham. 20 July: The first “heavier than air” commercial crossing of the North Atlantic took place using the Short-Mayo composite – Imperial Airways’ ShortS20 floatplane G-ADHJ was launched from the Short S21 flying boat G-ADHK near Foynes and flew non-stop to Montreal, a distance of 2,930 miles in 20 hours 20 minutes. The return flight was via the Azores and Lisbon. 1939 To help promote use of the Air Mail service, in June and July, Imperial Airways participated with Pan American Airways in providing a special “around the world” service with Imperial carrying the souvenir mail eastbound over the Foynes, Ireland, to Hong Kong portion of the New York to New York route. Pan American provided service from New York (departing on June 24) to Foynes (via the first flight of Northern FAM 18) and Hong Kong to San Francisco (via FAM 14), while United Airlines carried it on the final leg from San Francisco to New York where it arrived on July 28. Captain H.W.C. Alger was the first pilot to fly the inaugural air mail flight carrying mail from England to Australia for the first time on The Castor for Imperial Airways’ Empires Air Routes, in 1937. 1938 Compared to other operators (Air France, KLM, Lufthansa) Imperial was lagging behind in Europe. 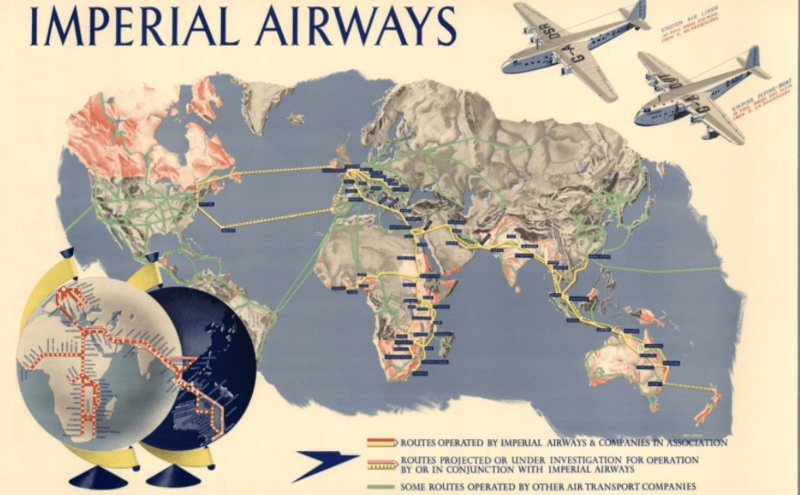 The Cadman Committee recommended expanding UK air services to Europe, with Imperial Airways concentrating on development of Empire air routes and British Airways Ltd (which had more modern aircraft and better organization) should, in general, develop air services in Europe. This article was first posted on 1st March 2018.